Lakota East girls volleyball standout, Ashley Evans (2013), continues her illustrious volleyball life as a professional in Europe. The former Evans was All-Everything during her high school days as a Thunderhawk, then at Purdue and now in Spain with the professional team, Voleibol Logroño. Below are several links that highlight Ashley’s outstanding accomplishments on and off the volleyball court. Evans YouTube Video Highlights at Purdue. WE ARE THUNDERHAWK PROUD OF YOU!! Graduated as an Honor Graduate, scoring in the top 5% of his class of 673 Sailors. This is based on a compilation of Physical Fitness testing, Academic testing, Personal Inspection tests and Character & Integrity scores as given by direct commanders. Was 1 of 7 Sailors awarded a promotion to E-2 by direct commanders based upon overall boot camp performance. Was awarded a 2nd promotion to E-3 by Oceana Naval Base “A” School Training based upon overall boot camp performance. Scored 3rd highest in Academics out of his combined division of over 200 Sailors. 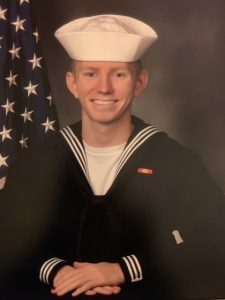 Lakota East is now well represented in the Navy. Logan is proof that there IS hope to succeed if you find a passion and are willing to put in the hard work! Congratulations to Logan and his family! Congratulations to Madeline Garda for being named to the U.S. roster for the 2017 Summer World University Games Taipai! She is the first BGSU Volleyball player to represent BGSU at this big international sporting event. Madeline also lead the NCAA in digs this past season! The Lakota East Athletic Department and Lakota East High School would like to gratefully acknowledge the ongoing support of Beacon Orthopaedics and Sports Medicine and The Christ Hospital. This year Beacon Orthopaedic and Sports Medicine and The Christ Hospital sponsored four scholarships that were awarded to four Lakota East High School Senior Student Athletes. A very special congratulations goes to Abby Whayne, Joe Cooney, Sidney Pinder and Emily Niehaus for being awarded the Beacon Orthopaedics and Sports Medicine and The Christ Hospital scholarships for the 2016-2017 school year. Ashley Evans can add one more accolade to her outstanding volleyball career. She has recently been named to the USA Collegiate National Team. Evans is a setter for Purdue University and was a 2013 graduate of Lakota East High School. She will train and compete with 36 other college standouts from around the country. Ashley was an outstanding high school player and was the GMC Player of the Year for the 2012 season. Along with many other awards, she was named an Academic All-American for the second straight year in December of 2016. The redshirt junior guided the Boilermakers to a 19-14 mark in 2016, including an NCAA Second Round appearance. She helped the team to a hitting percentage of .250 or better in 19 matches, including .300 or better 12 times and .500 or better once. The Liberty Township, Ohio, native set Purdue to a .517 clip against Indiana on Sept. 24, marking the fifth better hitting percentage in program lore and the second best in the rally scoring era. Evans also guided the team to a program NCAA record mark of .454 against Iowa State in the first round Dec. 1. She dished out 10.88 assists per set, ranking 38th nationally and fifth in the Big Ten, while also adding 2.07 digs per set and a team-best 29 aces. The redshirt junior led the Boilermakers in blocks three times and in digs twice. The two-time Academic All-District and three-time Academic All-Big Ten selection is one of just six setters in Purdue history with 2,000 career assists and 750 digs. All told, Evans boasts 2,781 assists and 823 digs, including 39 double-digit dig efforts. We are all Thunderhawk proud of you! COLORADO SPRINGS, Colo. – Three Boilermakers were selected to the U.S. Collegiate National Team-Minneapolis on Monday. Sherridan Atkinson, Ashley Evans and Brooke Peters will train and compete alongside 33 of the nation’s top collegiate volleyball student-athletes in Minneapolis, Minnesota. Purdue leads the conference, accounting for three of the eight selections hailing from the Big Ten. READ FULL ARTICLE HERE!! COLORADO SPRINGS, Colo. (May 1, 2017) – USA Volleyball is proud to announce 31 of the 36 players who will train and compete as part of the U.S. Collegiate National Team-Minneapolis (CNT-Minneapolis) program. Five spots remain open for the CNT-Minneapolis program pending final outcome of the U.S. Women’s Junior National Team’s results at the Women’s U20 Pan American Cup held in early May. READ FULL ARTICLE HERE!!! The 2017 Lakota Hall of Fame Class was announced earlier this week. 3 Lakota East Alumni were elected to this years class. Ticket information for the enshrinement ceremony HERE. Lindsay earned three varsity letters while playing on three of the best softball teams in Lakota district history. She was a pitcher for teams that won two GMC championships, went to two state “final fours”, and were three times ranked #1 in Cincinnati. She was twice named to All-State first teams becoming only the second Lakota softball player ever so honored. She was the Cincinnati Player of the Year in 2006 and the GMC Player of the Year in both 2005 and 2006. Her cumulative record in OHSAA tournament competition was 10-2, giving her the most tournament wins in Lakota softball. She achieved tournament wins as a sophomore, a junior, and a senior. She was credited with two regional championship wins and there have been only four such wins in all of Lakota softball history. Her name still appears in the OHSAA record book standing at 11th with seven no-hitters in a season, and at 15th with fifteen no-hitters in a career, both tops for Lakota pitchers. She pitched with power and holds the Lakota all-time record high average of 11.9 strikeouts per seven innings. She also pitched with consistency and holds the Lakota all-time career winning percentage record of 84.8%, winning 56 of 66 games. Bodeker continued her softball career at the University of Akron (2007) and the Ohio State University (2008-2010). While at OSU she forged a record of 27-14 and was the starter in the Buckeye’s nationally televised NCAA 2009 super regional game. Josh earned seven varsity letters playing three different sports and in six of those seasons was named to all GMC teams, twice for football, three for basketball and once in track and field. As a wide receiver in football he set and still holds the Lakota school district career receiving records of 1793 yards and 21 touchdowns scored. He was the receiving leader for Lakota West’s first OHSAA State playoff team in 2004. He was twice selected to All State basketball teams, second team in 2006 and honorable mention in 2005. His 2006 team advanced to the regional finals, the final eight in the state. He is the leading shot blocker in Lakota school district history with 159 and ranks third in district history in rebounding at 601. He also maintained a double figure scoring average (10.7 ppg) over the course of four seasons and 77 varsity games played. In a high school track and field career that spanned just 43 days, he was the GMC champion, the Cincinnati District champion and, finished 11th in the State in the high jump. He was a member of the Cincinnati District champion 1600-meter relay team and, he was a member of both 800-meter and 1600-meter relay teams that set new Lakota West records. He is one of only four male athletes in the history of the Greater Miami Conference known to have received all GMC 1st team honors in the fall, winter and spring seasons of the same school year. Josh earned a scholarship to play football for the University of Louisville where he successfully competed in four seasons, making catches for 1253 yards in 48 games. While at Louisville he also filled in briefly with a short-handed Louisville basketball team, playing four minutes and scoring a basket in the NCAA tournament bound Cardinal’s televised win over Kentucky. He has since played football professionally at the New Orleans Saints pre-season camp, with the Iowa Barnstormers of the Arena football league, and with Edmonton of the Canadian Football league. He currently plays for the Iowa Cylones of the Premier Basketball league and was that league’s Rookie of the Year in 2015. In his four seasons at Lakota East, James was one of but a few Ohio athletes to ever be named to four All-State basketball teams; honorable mention as a freshman, third team as a sophomore, second team as a junior, and first team as a senior. To that he added Street and Smith honorable mention All-American honors at the conclusion of his senior year. He was the Cincinnati Player of the Year (Cincinnati Enquirer) for the 2005-2006 season, the first Lakota basketball player ever so honored. Additionally, he was twice named GMC Player of the Year, and to numerous other player of the year honors as well (Butler County, etc.). A prolific scorer, he led the city with his 27.7 points per game scoring average in 2005-2006. This is the highest points per game average ever recorded by a Lakota player. His final career total of 1906 points for a 22.2 points per game career average also stands as the Lakota District boys scoring record. He was in the varsity starting lineup for all 86 of his high school games and stands fourth on the Lakota all-time list for total games played. A consummate team player, he also was among the team leaders in all statistical categories, including assists and rebounds, holding the school career rebounding record for several years. He led the Thunderhawks to the GMC co-championship for the 2004-2005 season. James played in a record 130 games for the University of Miami (Fla.), starting in 84 including NCAA tournament games. He is the only Lakota player to score over 1000 career points in both high school and at a NCAA Division 1 college. He led the Hurricanes in scoring with 391 points as a senior and totaled 1090 points for the Hurricanes to finish in their all-time top 25 in scoring. Following college, he played overseas in the Israel Professional League. James was inducted into the Butler County Hall of Fame in February of 2015 and is currently a basketball coach on the staff of his alma mater, Lakota East. Meagan played four seasons of varsity volleyball, all in the starting line-up, and all on winning teams. As a senior she was named to the All-State first team after leading Lakota West’s 2005 team to the GMC championship, the Cincinnati District championship, and the Southwest Ohio regional finals. That team finished the season with a 20-6 record to become the first Firebird team to achieve twenty wins. Meagan was named to All GMC teams in each of her four seasons, second team as a freshman and first team in each of her final three years. She was voted the league’s Player of the Year in 2005. A dominant front line player, she became the first in Lakota district history to be credited with over 1000 career kills. Ten years later she is still just one of only two to reach the 1000 mark. Her senior kill total of 406 still stands as the Lakota district single season record. She also holds all Lakota West records, career, and season, for blocks. Meagan played four seasons for University of Pittsburgh in the Big East Conference. In her first three seasons at Pitt she was named to the All Big East second team. In her final season she was named to the Big East 1st team and further honored by selection as an NCAA D-1, 3rd -Team All American. She is still ranked #2 at Pitt in all-time career solo blocks. Scott was the first wrestling head coach at Lakota West and led that program through 13 highly successful seasons. Prior to that he had served as an assistant coach for six seasons at Lakota. In dual meet competition his teams achieved 149 wins, more than has been achieved during the tenure of any of the 13 head coaches that have coached wrestling in the Lakota High Schools. Two of his teams were voted Cincinnati Metro champions by the Cincinnati Enquirer Coach’s Poll. When it became tournament time in early February, he carried on the old Lakota tradition of designating it as the month of champions. In his years as head coach he watched his athletes mount the top step of the victory stand as champions 110 times at the GMC, sectional, district and state series of meets held during this month. That number has also not been matched or exceeded during the tenure of any past or present Lakota district wrestling coach. He is one of the few coaches to have coached a senior National Champion and has taken four athletes to the National tournament with all four attaining top five finishes. He rolled these individual successes into team successes, which yielded Lakota West team championships in seven GMC meets, seven sectional meets, and a district meet. His 2006 and 2007 teams both finished fifth at the State Final meets. These two finishes were out of an initial field of 173 D-1 schools, and are tied as the highest finishes by any Lakota district wrestling teams. His name will now stand beside four of his former athletes already in the Lakota Hall of Fame, with others expected to follow. Alex played four seasons of varsity volleyball, all in the starting line-up, and all on winning teams. Playing primarily as the team’s setter, he directed the attack and still holds the Lakota East season and career records for most assists. As a senior he served as the captain of Lakota East’s 2006 State Final Four and GMC championship team. He contributed a match high 40 assists in the win that vaulted the Thunderhawks into the Final Four. He was a standout player, as a freshman, on Lakota East’s first league championship team in 2003. At the conclusion of the 2006 season he was selected to the All Ohio, All Cincinnati, and All GMC 1st teams. In addition to winning his second all GMC 1st team honor in 2006 he was also named as the GMC Player of the Year. Alex played four seasons for Mount Olive University, leading them to the Carolina Conference Championship in 2010. He was the Trojans setter and floor captain, and at seasons end was voted the team’s most valuable player. In that season he tallied 897 assists ranking him 3rd nationally among NCAA D-I/D-II players. (Both D-I and D-II schools compete together). He was named women’s volleyball head coach at Shepherd University in 2015 following several years as a Western New Mexico University men’s assistant coach. William earned four varsity letters competing in Track and Field. He is the only male athlete in Lakota history to earn two gold medals at the State track and field meets. He won the 800-meter run gold medal as a senior in 2006 and his first gold medal as a member of the winning 3200-meter relay team in 2005. He was invited to the 2006 Nike Outdoor National meet where he ran the best 800-meter race of his high school career. That time (1:52.24) still stands as the second fastest 800-meter entry in the Southwest Ohio Track and Cross Country Coaches Association record book. That record book includes records from all 70+ Cincinnati Metro area high schools and for the past 37 years that these schools have been running metric distances. His 800-meter run and 3200-meter relay times still stand as Lakota School district records. He was the GMC 800-meter champion in 2006 and earned a total of six All GMC track and field citations. He successfully competed at all distances from 200-meters through 1600-meters. He won the Harrison Invitational 1600-meter run in the fifth meet of his freshman season. He set Lakota East school records and advanced to the 800-meter district and regional meets as a sophomore. He achieved a rare triple win of the 200, 400, and 800-meter races at the Sycamore dual meet as a junior. Later in his junior season he qualified for the State meet in both the 400 and 800 meter races. Casey is one of only four Lakota athletes to earn a varsity letter in every season of their high school career. In all, she won 12 letters while competing in cross country, basketball, and track. She earned All State cross country honors in three seasons by finishing in the State meet top 25. Her best finish being fifth in 2002. In 2002 she won both the Cincinnati District and GMC cross country championships. She earned spots on four All GMC teams, three times to the first team and once to the second. As a basketball player she led the Thunderhawks in scoring in both her junior and senior seasons. As a senior she was among the top 10 scorers in the league and awarded an All GMC first team selection. This followed her selection to the All GMC second team as a junior. On the track, she added four All State honors two at 800-meters, and two at 1600-meters. She achieved her best State meet finish of fifth in the 1600-meter. In 2003, she finished eighth, with a time of 4:58.88. Only three girls have ever broken the five minute mark at this distance and she is the only one to do it twice. In cross country and track and field combined, she won 29 individual running races, five on the cross country trails and 24 on the oval. This is thought to be the highest individual total in Lakota district history. Nearly half of these wins were in major meets, six at Cincinnati District meets, five at GMC championship meets, and one at the Southwest Ohio Track Coaches Classic meet. Casey was a member of both the cross country and track and field teams for the University of Louisville. WEST LAFAYETTE, Ind. – Balancing a strong performance on the court and stellar work in the classroom has brought setter Ashley Evans Academic All-America honors for the second straight year. Evans, a mechanical engineering major, was named as a second team Academic All-America honoree as selected by the College Sports Information Directors of America (CoSIDA) on Thursday, following third team accolades in 2015. Only 18 Division I volleyball players, six to each of three teams, are honored with Academic All-America accolades each year. BGSU standout libero, Madeline Garda (LEHS ’13), collected her fourth “Conference Player of the Week” award of her Senior season this week. Garda, who currently leads the country with 485 total digs, and 6.64 digs per set, was also named “MAC Scholar Athlete of the Week” on October 12. Garda has had quite the season, breaking the single-game record for most digs in a match (40) versus Drake, and she was named Tournament MVP of the BGSU Invitational and the UIC Invitational.